Lambertville, NJ -- A vase made by Frederick Hurten Rhead in Santa Barbara, California, around 1915, stamped with a medallion of the potter at his kiln, is now the most expensive piece of art pottery sold at auction. A record $516,000 (includes buyer's premium) was paid for the 11 ¼" high vase by Florida collector Rudy Ciccarello at the Rago Arts and Auction Center in Lambertville, New Jersey, on March 10. The vase was estimated at $40,000/50,000 because of a few hairline cracks. The underbidder was a collector on the phone. After receiving applause from the standing-room-only crowd in the salesroom, Ciccarello said he is seeking premier pieces for his Two Red Roses Foundation in Tarpon Springs, Florida. "It will be at the Saint Petersburg Art Museum in the summer of 2008 when my collection of art pottery will go on view for twelve weeks in the museum's new seven-million-dollar wing," said Ciccarello. "It is one of Rhead's very best pieces, and the likelihood of my finding another comparable in my lifetime is small." Rago said it is the finest of Rhead's most mature work in art pottery. "It is Rhead's interpretation of the California landscape. The incised tall, tan trees, mottled brown canopy of foliage against the midnight blue sky, and the sage green grass and the ocean and clouds beyond make it more than a piece of glazed pottery. It is a plein-air painting." The consignors were Jim and Victoria Carter. "Jim was an All-Pro middle linebacker for the Green Bay Packers," said Rago. "He bought it for thirty thousand dollars in 1993, big money at the time, and he held on to it." Rago called Rhead the Forrest Gump of art pottery. "Rhead was everywhere art pottery was happening, but unlike Forrest Gump he was the stick that stirred the drink, and when pottery art was no longer in vogue he went to work for Homer Laughlin China Company and created Fiesta ware." Frederick Hurten Rhead (1880-1942) had a long and varied career. Before he was 20 he was art director of the Wardle Art Pottery in Hanley, Staffordshire, England. In 1902 he came to the United States. He worked at the Vance/Avon, Weller, Roseville, and Jervis potteries. After a stint as pottery instructor at University City Pottery on the outskirts of St. Louis, where he worked closely with Adelaide Robineau, Rhead supervised the Arequipa Pottery for Dr. Philip King Brown's tuberculosis sanatorium in Marin County, north of San Francisco. 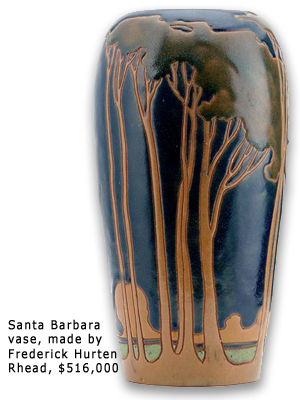 In 1914 he established his own Rhead Pottery in Santa Barbara. In 1917 he closed his pottery and moved back to the Midwest as research director at the American Encaustic Tiling Company, Zanesville, Ohio. From 1927 until his death in 1942 he worked for the Homer Laughlin China Company in Newell, West Virginia, and introduced the concept of mixing and matching Fiesta ware colors in a single service.